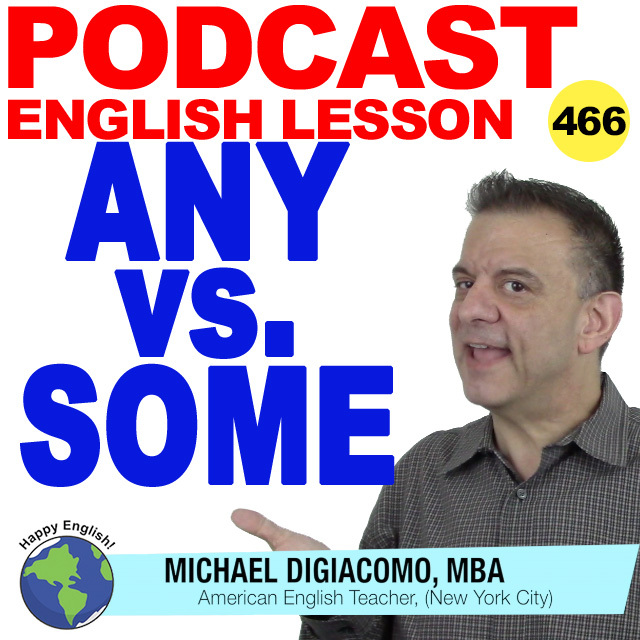 The words some and any can be tricky for a lot of English learners because they both have basically the meaning. Some and any refer to an unspecified amount of something. What makes these little words tricky is not what they mean, but how they are used. For today’s English lesson let’s have a look at how we can use some and any in everyday English. I need to get some paper for the copy machine. There are some cars parked in front of my house. I feel like having some coffee, so I’m going to take a walk to the deli. I’m trying to find someone who can help me at my office. There is something on the window. I need to clean it off. I want to go somewhere fun for my next vacation. Is there any paper for the copy machine, or should I order it. There aren’t any cars on the street today. I wonder why? I didn’t have any coffee this morning so, I’m going to take a walk to the deli. There isn’t anything in the refrigerator so let’s go shopping. Would you like anything to drink? (or) Would you like something to drink? Would you like any help? (or) Would you like some help? Let me know if you need any help (or) Let me know if you need some help. If you need any help please call me. (or) If you need some help please call me.